Sadyk Sher-Niyaz is a successful public figure, producer and director who followed his dream to attend film school in Moscow at the age of 38. He is the Chairman of the Union of Filmmakers of Kyrgyzstan, the founder of the Aitysh Public Fund, which includes Aitysh Film and the Kalemger Literary Club, and one of the founders of the Ak Ilbers Film Awards. In 2011 he established the International Film Festival 'Kyrgyzstan - Land of Short Films' which is held every December in the capital of Bishkek. In 2015, his directorial debut film 'Kurmanjan Datka Queen of the Mountains', was Kyrgyzstan's official Oscar submission and gained critical acclaim and wide audience appreciation. The awards season campaign launched a sold-out red carpet awards screening introduced by Sharon Stone, garnering awards buzz and reaching the rank of #12 out of 83 foreign films. The film was also featured at the Palm Springs International Film Festival. Georges Chamchoum is an Emmy and multiple award-winning Film Director and Producer, born in Niger West Africa of Lebanese origin. He was educated in France, Germany and Wales and entered the film industry in 1968 after graduating from the Conservatoire du Cinema Francais in Paris. Georges has directed and produced over 35 features in Europe, Africa, the Middle East, Canada and the USA, with many screened at various International Film Festivals and Universities. He has also organized numerous film festivals since 1982, most notably as Jury Delegate for the Festival du Film Fantastique et de Science Fiction de Paris (France) and as the Executive and Program Director of the Monaco Charity Film Festival. Georges currently sits on the Boards of the Yakutsk International Film Festival (Yakutia, Sakha Republic), the Notre Dame University International Film Festival (Lebanon) and the Beirut International Women Film Festival (Lebanon). In addition, he is Co-founder of Film Festivals Cinergy, a union of film festivals around the world to promote and champion talent in film-making. Most recently, in 2017, he was named one of the 100 most influential Lebanese in the world, being honored in a special commemorative publication to mark the occasion, and in December 2018 he was the recipient of the South Korean Ministry of Culture 'Dari Award' on behalf of the Asian World Film Festival for Bridging the Culture of Korea with the USA. Georges has lived in Los Angeles for the past 30 years. Asel Sherniyazova has an economic and business educational background and for two years studied in China ( Shanghai Organization of Cooperation ), representing Kyrgyzstan on the Cross-Cultural Exchange Program. Fluent in Chinese, Russian, English, and Kyrgyz, she is a Co-Founder of a Business Consultancy Company in China, Investment Corporation in the USA and a Non-profit organization in Kyrgyzstan. She worked on the Oscar and Golden Globe campaigns for the multi-award-winning film ‘Kurmanjan Datka Queen of the Mountains’ which was submitted for Best Foreign Language Film, every year she guides and consults movies from Asian region introduced for the Golden Globes at the Asian World Film Festival. She is an integral part of the Festival, managing the structure and strategic content, coordinates Programming, Sponsorship,Promotion, also liaising between Consulates, Embassies, Ministries and Organizations from Asian Continent. Brett Syson has had links with Asia for the past 20 years. From 1995-1998 he worked as the Team Leader for a World Bank/British Council Project in Kyrgyzstan. He was also the British Honorary Consul in Kyrgyzstan and was instrumental in organizing the visit of HRH The Prince of Wales to Bishkek in 1996. During 2001 Brett attended the New York Film Academy and since then has worked on the Management and Marketing Team for Odeon Cinemas in London and later became involved with the Kyrgyz Film Industry. He has been a Producer and Consultant on several award-winning Kyrgyz films, including two Oscar submissions for Best Foreign Language Film. Originally from the city of Osh in Kyrgyzstan, Sultankazy moved to Los Angeles in 2013 to pursue a career in film. Focusing on directing, script writing, and producing, he enjoys all aspects of the film industry and since 2015 has been an integral part of the Asian World Film Festival team. During 2017 Sultankazy worked at the Los Angeles Asian Pacific Film Festival as a Production Coordinator. In addition, he has spent the past 6 years as a volunteer for various non-profit organizations in Kyrgyzstan and the United States. Lani Netter, born and raised in Malibu, California, is a documentary filmmaker-- her most recent project, a documentary on the Holocaust. An active philanthropist, Netter sits on several nonprofit boards including Red Cross Tiffany Circle, Arrow Child and Family Foundation, Alpha Youth, Alpha Southern California and the Film Advisory Board at Pepperdine University's Center for Entertainment, Media and Culture. In addition to her film projects, Netter is working in partnership with the Pepperdine's Graduate School of Education and Psychology to develop a comprehensive ethics curriculum. Netter has collaborated with Georges Chamchoum on two film festivals. She is married to Producer, Gil Netter, most well-known for his Academy Award-winning work on Life of Pi and The Blind Side, among others. Gil and Lani are working together on the movie, The Shack, which just wrapped physical production and is expecting to be released in 2016. 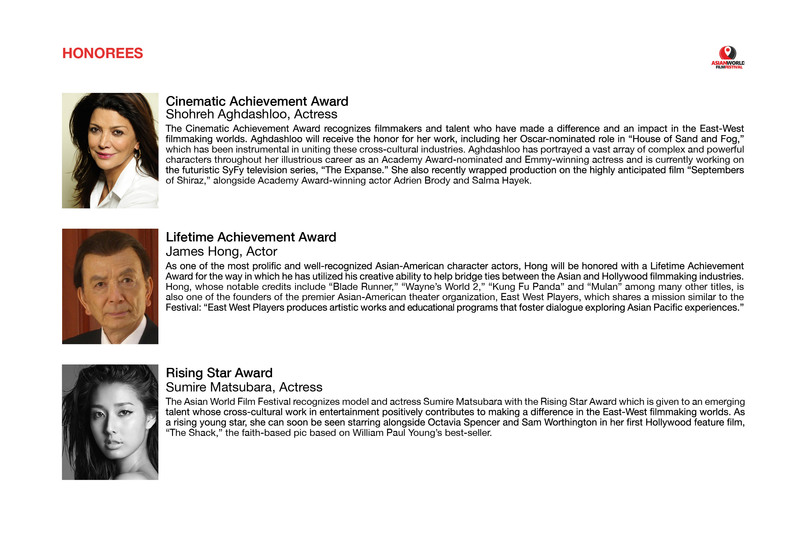 Takhee Han is a twenty-year veteran in film production and distribution in US and Korea. He produced the feature films: "89 Human Market","Mayumi","Vanished ","3 Ninjas Part 1~3", and "Galgamesh". He also distributed both the critically and commercially acclaimed films, "Les Amants Du Pont-Neuf", "Chunking Express","Swordsman ", and "The Tai-Chi Master", in Korea. He graduated from The Graduate School of Arts: Chung-Ang University with a degree in arts management, and is currently a member of The Korean Society of Producers and Filmmakers of Korea. Kathleen started out as a Research Assistant for the Ministry of Culture in Taiwan as well as working for Taiwan's leading television station, Sanlih Television. With a Masters degree in New Media Management from Syracuse University, she has run various digital marketing campaigns for a number of different companies and has spent her entertainment career in film marketing and acquisitions while serving as a coordinator at a leading film sales company, VMI Worldwide. Kathleen has also functioned as a communication liaison point with producers from China and has been instrumental in bridging China and the US in various aspects of cultural and business relations. Mr. Charles Choe is a Principal at Elite EB5 Solutions (EES), an immigration investment consulting company, and CEO for Each Home Property Insiders, LLC a real estate investment company. Mr. Choe brings his wealth of connections and knowledge in international distribution and marketing to both the Asian World Film Festival and his companies to help process manage, consult, and connect clients to the right partners for their projects. Additionally, Mr. Choe has over 10 years of experience in an executive role with Overseas Korean Trades Association (OKTA) that has over 20,000 people in membership and has worked at one of the largest financial institutions in South Korea. Richard started his career in offshore oil exploration in the Norwegian Arctic, and after gaining his MBA directed product development teams in both Germany and Florida. He later became Business Development Director for Tyco’s $600m Electronic Security Division, working extensively with Asian strategic partners.Following a Masters at Harvard Richard consulted in the commercial real estate and renewable energy sectors, as well as undertaking fundraising work for California non-profits. Richard later founded the United World Colleges Alumni Network in Southern California with over 300 members, along with its FilmMakers Group.Richard served as Commercial Director for AWFF in 2015 & 2016, bringing major international sponsors to the festival. Richard is now our Director of Business Liaison for the UK & EU based in London. Raised in the Midwest and after finishing a MA in Parapsychology, Chris worked in sales training a few years, then went into entertainment. For 35 years he has been acting, teaching and writing. With well over 150 credits, he has performed with some of the greats like - Alec Baldwin, Kathy Baker, James Garner, Tom Hanks, Jack Lemon, Elisabeth Shue and Billy Bob Thornton, under the hand of such artful directors as John Avildsen, Jon Avnet, Doug Campbell, Bruce Caulk, Georges Chamchoum, Don Chaffey, the Coen Brothers, Wes Craven, Jan Eliasberg, Russ Friedenberg, Philip Kaufman, Carl Reiner, Lewis Teague, Billy Bob Thornton and Robert Zemeckis. His other interests include travel, filmmaking and Eastern philosophy. He has made several short comedic/travel films, having taken him to more than 55 countries. Grace Elizabeth Hwang has been an avid supporter and advocate for the arts, film and theatre throughout her lifetime. In LA, she worked with the Center Theatre Group and the Los Angeles Theatre Center. She was also involved with the Asian American community working in business development and banking. After living in NYC for fifteen years, her love for theatre and film grew. She is currently working on a TV pilot and two screenplays to develop and produce. Grace is thrilled to be involved with AWFF because there is no time like the present to promote diversity and inclusion in our world today. Una Wang is the Chairman/Founder of MoRedii and Director of Development (Relations with China) for AWFF. She is an expert in combining markets in both China and the US, as well as helping US brands to enter the Chinese market, connecting Chinese organizations with US resources. By majoring in cross-culture e-commerce, Una built up numerous connections with investors from China and helps businesses with a wide variety of communications needs. At the beginning of her career, she worked as a journalist for several professional media economy companies in China. She received her degree in International Marketing Management in Singapore, after which she worked at SSMC, the largest local semiconductor fabrication company in Singapore, for four years. This experience provided Una with the ability to offer insightful opinions and recommendations regarding the development of AWFF. Her vast experience has enabled her to become conversant in businesses targeting both Chinese and English speakers and her targeted marketing strategies and unparalleled promoting skills have helped AWFF to conquer the Chinese market and build healthy relationships with important Chinese stakeholders. In addition, as a result of Una's considerable efforts, AWFF has attracted extensive Chinese media online impressions over the past few months. Eileen Chen and her Novartizan Team has been devoted to entertainment industries for years and tirelessly brings eastern and western cultures together. In 2018, the Nova team was the exclusive partner with Iqiyi in producing the most popular program, Rap of China. The team is also working with MCN channels to create innovative contents both in China NZ the US. In addition, the team has introduced famous production talents to China for film/TV/entertainment collaboration. Eileen is proud to serve as the Event Director for Asian World Film Festival 2018! Maxim Yurov is the Director of 'Hello Ticket! ', a Russian ticket service company which sells tickets online for national and international cultural and sporting events. His responsibilities include the organization and supervision of film and music festivals, concerts and theatrical shows, including celebrity interviews, photo shoots, radio and TV coverage and dissemination of information to the media. In addition, Maxim has undertaken a number of sociological research studies aimed at analyzing and developing specific strategies and recommendations for event management and promotion. Scholar and Expert on Soviet and American Film Industry, political and civic activist, he published in Russia 16 books on sociology of cinema and grassroots democracy and social capital in times of Perestroika. Ph.D., Professor, writer, film critic and sociologist, was one of the participants who started the “Revolution” at the Filmmakers Union if the USSR at the end of the 1980’s. He headed the famous American/Soviet Film Initiative, influenced the Moscow International Film Festival towards being more open, initialed the HBO movie “STALIN”, starring Robert Duvall, hosted the National educational TV talk Show “What is New Hollywood”, launched the first Business School in Russia for Producers followed by his textbook “Film as a Business”. In 1998 he was asked by Nikita Mikhalkov to set up and edit the weekly trade paper of the Filmmakers Union “SK-News”, where he successfully worked till 2001. For many years Igor was teaching in VGIK (State Institute of Cinematography) Moscow, at the world known liberal State University High School of Economics, Moscow, and at Chapman University, Orange County, Los Angeles. Being expelled from Putin’s Russia as a “foreign agent” (since his NGO “Citizen Foundation” was sponsored by the US AID and other West funds), he recently wrote the book “Confession of a “Foreign Agent” which was highly acclaimed by Richard Pipes as a deep insight of the transformation happened in the Soviet Union and Russia for the last half century.